With a top speed of only 12 pages per minute, the HP DeskJet 970cxi is a bare bones inkjet device that is nowhere near fast enough to be considered for anything but extremely light duty, personal use. 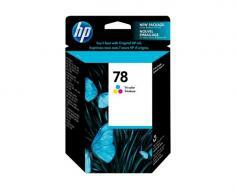 This color inkjet comes in a very small package, but does not have much to offer. If a printer operates at speeds of only 10 pages per minute in color and 12 pages per minute in black and white, it had better produce some dazzling imagery, and the HP DeskJet 970cxi comes through. Its maximum color resolution is 2400 x 1200 dots per inch, which is enough to accurately replicate near photo quality images. Unfortunately, black and white resolution tops out at only 600 x 600 dots per inch. One other small benefit of owning a stripped down unit such as this inkjet is the petite size and footprint they offer. 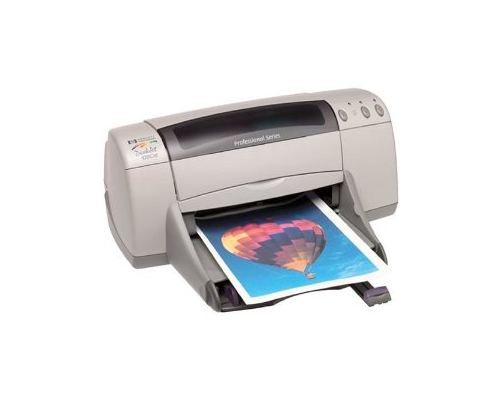 The HP DeskJet 970cxi boasts dimensions of 17.3 in. x 16.9 in. x 7.7 in. (W x D x H), which makes it a good option for those dealing with very limited work space. Its total weight also lends itself to the smaller office or desk with a total of 14.7 pounds including ink but not paper. With a unit this small, setup and relocation are easy. HP, like other businesses, has a tendency to leave out some of the details concerning their product in an effort to boost sales. The 12 and 10 page per minute print speeds advertised on the box can be deceiving, as these speeds are exclusively for draft quality prints. Normal quality printing will cause a major reduction in speed down to 6.5 pages per minute in black and white and 5 pages per minute in color, or about half the speed of draft prints. Best quality is even slower with speeds of 4.7 pages per minute for monochrome and 3.1 pages per minute in color. Review it: "HP DeskJet 970cxi "
Like many inkjets, there are a lot of options when it comes to the HP DeskJet 970cxi’s consumables. Users can choose between high yield and standard yield, color or black, and high quality or regular quality inks. HP products are exclusively OEM, and therefore quite expensive when compared to third party ink manufacturers, but their print quality and accuracy are often superior. The standard black ink cartridge available offers up an 830 page yield, while the standard tri color cartridge can produce only a 450 page yield at 5% coverage. A high yield tri color cartridge is available that is a much better value and can produce up to 1,200 pages. The high yield cartridge costs only a few dollars more and produces nearly three times as much product. This printer also gives buyers the unique option of purchasing a, “high quality,” color ink cartridge that offers a 560 page yield and better color accuracy for a very small increase in price over the standard cartridge. 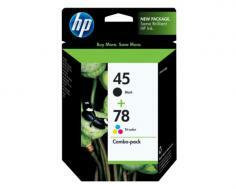 Black and color combo packs and color twin packs are also available to help reduce costs.